I will use any excuse to "fashionably" look and feel like a kindergartner, so naturally I am very excited about overalls being back in style. THEN: straight outta the 90s, Cousin Zoe rocked the classic jean overalls while I had on some fabulous floral ones from OshKosh. What a great time in fashion history. I found this red flannel, awesome ATL snapback, & vintage Gap overalls at Dynamite Clothing in Athens and added my favorite aerie tee (similar here) & Converses. For a cozy let’s make hot chocolate and watch Netflix all day style: classic cable knit sweater (similar here & here) and some brown birkenstocks. The truly daring move is to dress up your overalls… it sounds crazy & no matter how much you dress them up, you probably can’t/shouldn't wear them into a corporate office for casual Friday… but I did feel fairly sophisticated. So sophisticated that I suddenly thought I was in New York & I tried to hail a cab. It didn’t work but… you know, I felt cool. 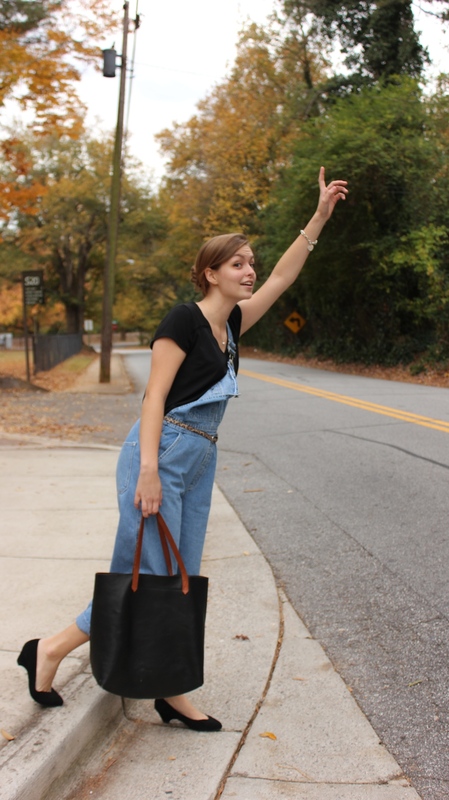 Overalls are baaaack. They are no longer just for kindergartners. Dress ‘em up, dress ‘em down, goof around in ‘em, or go on a date in ‘em. We all know that the best fashions are the ones that cover up your overgrown leg hair.